This week (September 15th-21st), Surfrider NYC is teaming up with groups across the city to challenge all of New York City to bring their own bags instead of consuming more single-use bags (i.e. paper or plastic) during #BYOBag Week. Our main focus is plastic bags but we’re saying “no” to all single-use carryout bags (including paper) to significantly reduce our environmental footprint. There are a ton of ways to reduce waste and help keep this planet clean and healthy not just for you but for future generations. Let’s start together today! Are you ready to help make a huge difference in NYC?! Let’s get started . . .
// Looking for a reusable bag? Start at home. Chances are you have a great bag stashed in a closet somewhere. You can also use a single-use bag that you’ve been hiding under your sink or in a cabinet – as long as it’s not a new one! // If you don’t have a reusable bag, you can find them almost anywhere. Most grocery stores sell reusable bags in a variety of options. Keep an eye out at community events for reusable bag giveaways. You can even make your own! // Put your reusable bag in your backpack, purse, or briefcase RIGHT NOW so you don’t forget and for quick access when you’re shopping. // If you forget your reusable bag – and the item is small enough to fit in your backpack, purse, or whatever you carry – use that! If you’re just buying one or two things you might not even need a bag. One last thing: Let your friends, family, classmates and coworkers know that you are participating in #BYOBag week! 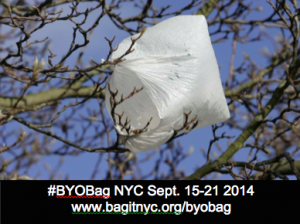 Talk about #BYOBag week on social media then send everyone in your family, office, school and neighborhood this email and invite them to join us! It’s going to be an awesome week! Have fun! 5-6pm: Citizens Committee for NYC reusable bag giveaway on the corner of Ashland Pl/Hanson Pl. (near Barclays Ctr.) with Council Members Cumbo, Lander, Levin on hand to distribute bags to commuters. 4-6pm: In coordination with MINDFUL+ created by Chantal Fischzang and Gala Narezo, on view in the Pepperman Family Fine Arts Studio. 7pm: Surfrider representatives will be on hand to discuss and answer questions about current initiatives including #BYOBag Week, Bill 209 and the upcoming People’s Climate March at Threes Brewing, 333 Douglass St, Brooklyn, NY. Join Bag It NYC Coalition Members including Surfrider NYC, NRDC and Citizens Committee for NYC at the People’s Climate March. We’ll be holding signs about how single-use bags reduction can lead to reductions in GHG emissions and providing information about the NYC Council bag bill.